This is a simple yet stylish customised trucker-style cap. 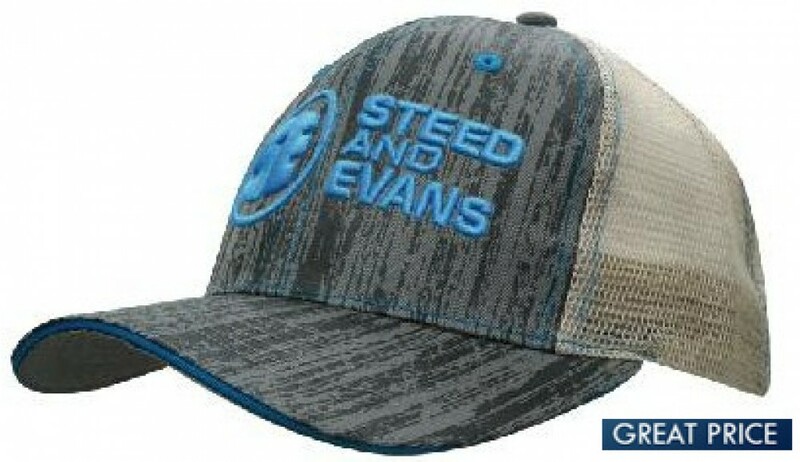 Its structured six-panel cap makes it very strong and long lasting and its pre-curved peak helps keeps the shape intact. The cap gives a smart but casual look. The fabric covered short touch strap keeps the cap in shape and in place. We will put your business' or clubs' logo on the front or sides of this attractive cap. Choose your preferred colours and contact us to have your branded artwork printed or embroidered on these handsome caps, suitable for staff uniform accessories, team uniform accessories or branded merchandise sales. These caps can also make great convention giveaways or gifts to valued employees or clients. All products include 8000 stitches of embroidery as standard. The cap best suits outdoor clubs, businesses and companies. Artwork for the cap has to be supplied in eps, pdf or high-resolution jpeg. The price excludes Goods and Service Tax. These great promotional caps are stocked in Australia and custom branded for you locally to enable a fast one week production time. Delivery is additional and we can advise you the fastest delivery times. Call us today for details.